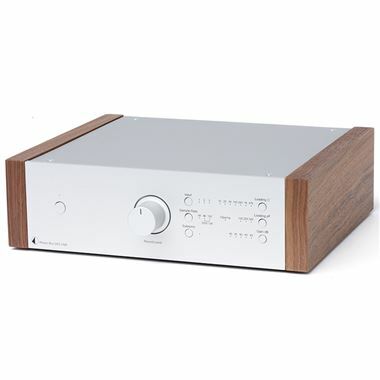 Project Phono Box DS2 phono preamp with HiRes digital USB output in Silver. Available with Online Finance and Free Delivery. A lot of people already have or plan to buy a very high quality turntable, driven by the fascination of the analogue sound. Many of them also want to record their vinyl in a simple, yet high-end way. The Phono Box DS2 USB is the perfect solution. It is a sophisticat-ed phono stage, based on a high-end passive/active ultra linear phono equalisation. MM and MC capability as well as extensive vari-able impedance and capacitance settings allow to match any cartridge, even of highest class for optimum performance. Two individual phono inputs allow you to use two different turntables or tonearm / cartridge combinations with different sound characteristics to perfectly match your preferred type of music. A very low noise and jitter free A/D converter transfers the analogue signal into high resolution digital format (PCM up to 192kHz or DSD 128). Via its USB output you can record your vinyl on any computer. There is also an analogue line input to digitalize other ana-logue audio sources. A standard line output to connect the unit to your hifi system isn’t missed. The Phono Box DS2 USB is manufac-tured in a beautiful chassis made out of aluminium and metal, which gives an elegant functional look and avoids the influence of me-chanical or electromagnetical interference.